Three years ago, ride-hailing giant Uber came under investigation for a tool called “God View” that allowed employees to track drivers and customers in real-time. Uber has since scaled that ability back, but Jalopnik has learned the company still deploys a revamped version of it, along with other secret internal tools, to target its drivers who also work for competitors. The objective is to identify those drivers and incentivize them with bonuses or subsidies to remain loyal to Uber over competitors they may also drive for, say, Lyft, according to sources with knowledge of the program who spoke on condition of anonymity about their existence to Jalopnik. The details were confirmed by one source with knowledge of the program, and partially confirmed by a separate, former employee. Uber didn’t confirm or deny the existence of the tools on the record to Jalopnik. Uber’s tactics here go beyond what has been previously disclosed about the $70 billion ride-hailing giant, and feels uniquely Uber—secretive and somewhat underhanded. For one thing, this particular use of what is now called Heaven View hasn’t been previously reported, and the tool itself has been cited in an ongoing lawsuit involving one of the company’s former security experts. It wasn’t immediately clear to what extent the tools are currently being used across the company. Though the tools aren’t ostensibly used to the detriment of drivers, they underscore the lengths to which Uber will go to influence individuals it doesn’t even consider employees, and gain control of markets across the U.S. It also comes amid a tumultuous time for Uber, as the company has been the subject of numerous controversies in recent weeks, including the revelation that it used a tool called Greyball to specifically target regulators looking into the company. One particular scenario described to Jalopnik is tied to when employees use the Uber app. When an Uber employee requests a ride for an Uber driver, the source said, the app prompts them to ask the driver whether or not they drive for a competitor. “It’s in the normal [Uber] app, just shown to employees,” the former employee said. Finally, some teams will actually open [Heaven View] on their computer and the Lyft app on their phone and find drivers in the Lyft app who also appear on Heaven in the same location. Those drivers are then tagged as competitive drivers. “This all has a ‘positive’ effect for the driver since they’re now targeted with incentives and subsidies aimed at keeping them loyal to Uber,” the source said, for instance, with extra bonuses if a certain number of rides were completed. It is not immediately clear what other incentives exist, but Uber does offer guaranteed fares and extra earnings to drivers if they fulfill certain requirements. The SLOG effort dates to the fall 2014, when it was revealed that Uber reportedly hired independent contractors to undermine its arch-rival Lyft by recruiting their drivers through various means—for instance, striking up conversation and getting them to sign up for the ride-hailing giant before the ride is complete. At the time, Uber confirmed Operation SLOG’s existence, but said the tactics were innocuous, at best, and didn’t go nearly as far as what was described in reports. The company said, for instance, that it relied on “brand ambassadors” to recruit at publicized events, or used promotions for riders and drivers to attract more drivers to the company. And there’s plenty of drivers to go after: it’s well-known that most work for more than one service. One survey suggested as many as two-thirds of drivers work for at least two ride-hailing companies. The source said Heaven View has a function that specifically allows it to view drivers. The SLOG-ing tools are used only to target drivers for other ride-hailing apps, according to the source, “never taxis.” It’s unclear to what extent that particular tool is currently being used, especially in the aftermath of Greyball. 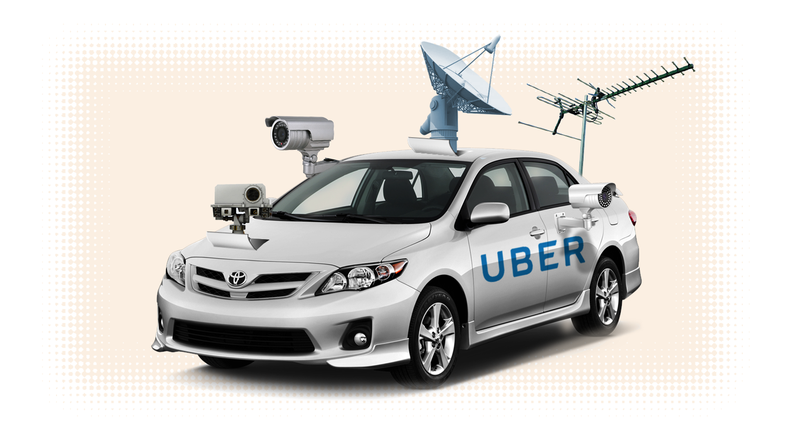 The Operation SLOG-ing tools disclosed to Jalopnik track with previous revelations about Uber. In 2014, The Verge reported that the company was using independent contractors to attempt to recruit drivers by requesting a ride, and then offering incentives to join before reaching a destination. But in December, Ward Spangenberg, a former forensic investigator for Uber who’s suing the company for age discrimination, said thousands of employees at the company could still search Uber’s database for ride information in real-time. It’s absolutely untrue that “all” or “nearly all” employees have access to customer data, with or without approval. And this is based on more than simply the “honor system”: we have built entire systems to implement technical and administrative controls to limit access to customer data to employees who require it to perform their jobs. This could include multiple steps of approval—by managers and the legal team—to ensure there is a legitimate business case for providing access. But Reveal cited four former Uber security sources who backed up Spangenberg’s account, which was described in a lengthy declaration filed under penalty of perjury. “[D]river information, including social security numbers, which were available, again, to all Uber employees without regard to any particular level of employment of security clearance,” he stated in the declaration. If you know anything these efforts at Uber or other things going on at the company, you can reach me at ryan.felton@jalopnik.com or through Signal.